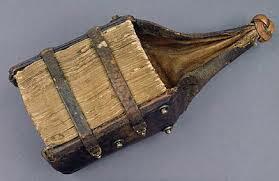 Taking a book with you to read on a journey was rarely an option in mediæval times. 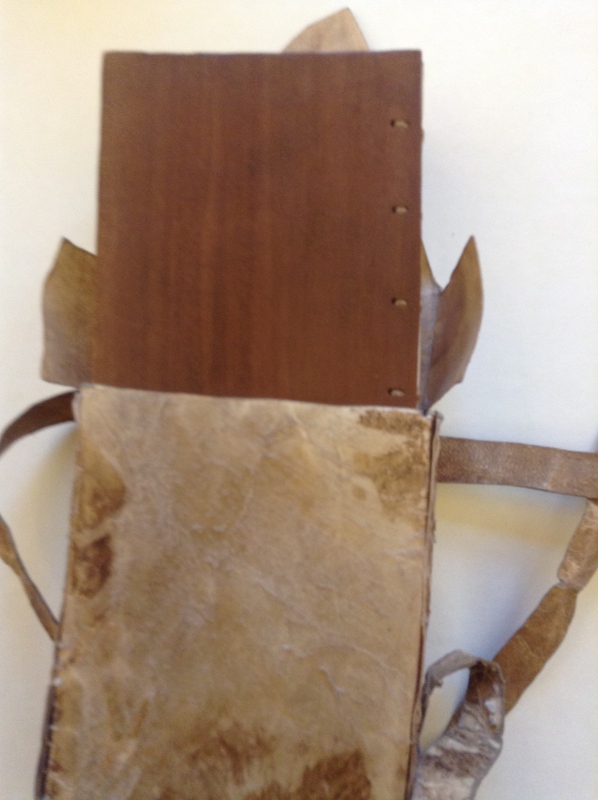 Vellum or parchment pages, oak boards and metal hasps and clasps all resulted in a heavy book, usually far too heavy to carry around easily – as with the book on the right. 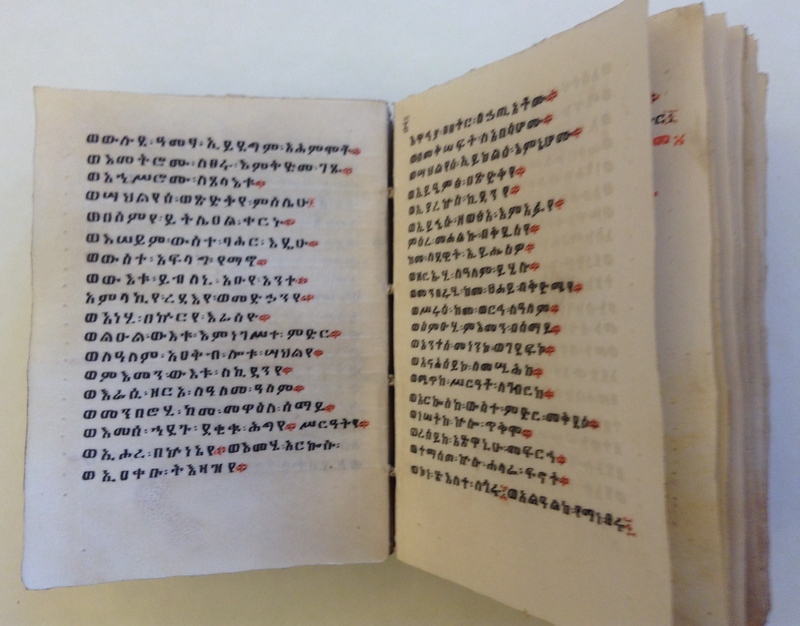 The eighth-century Codex Amiatinus, written in Northumberland and now in the Laurentian Library in Florence, takes two men to carry it – hardly a pocket book! 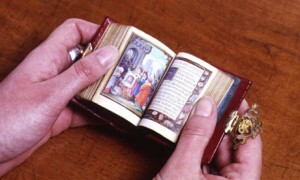 However, there were smaller books. Some Books of Hours and Psalters were tiny enough to carry on a journey, or to look at without having to sit at a table, as this cutie on the right. There were also special ‘carrying cases’ for smallish books, whereby the book was encased in a soft leather or cloth ‘chemise’ which ended in a knot. 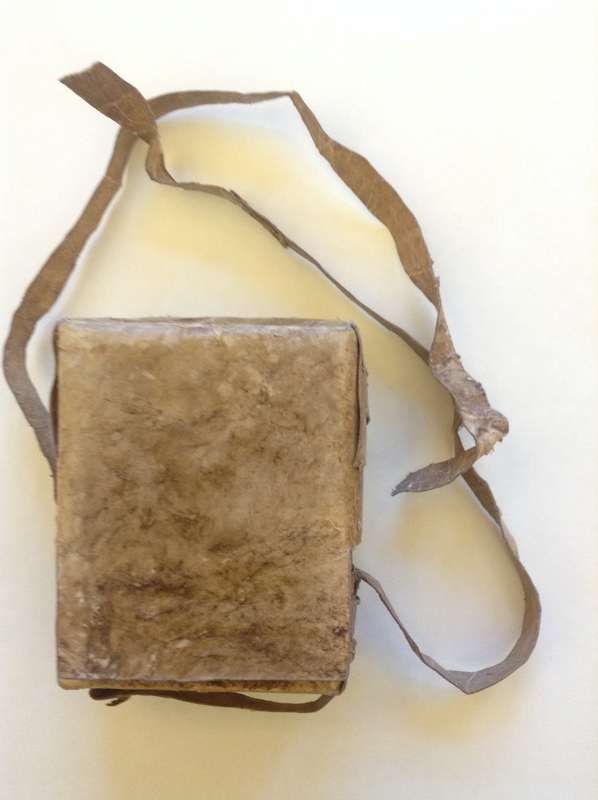 The knot was then tucked into a belt or a girdle, and these were called, surprisingly enough, girdle books! At the St Annen Museum in Lübeck, Germany, there is a carving of the Holy Family and St Anne. Spot the girdle books. 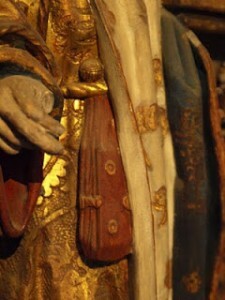 and the knot of a red leather covered one has been tucked firmly into a golden belt. Note the circular mounts on the covers; these were to stop the leather, or sometimes silk covered getting damaged or dirty when the book was placed on the top of a table or shelf. 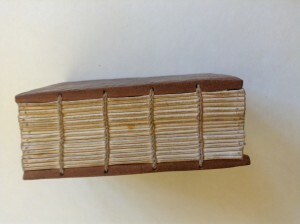 I was fortunate enough to photograph a girdle book of the Psalms belonging to a private collector. This is not mediæval but from the nineteenth century, it does, though give some idea of the variety of such books. 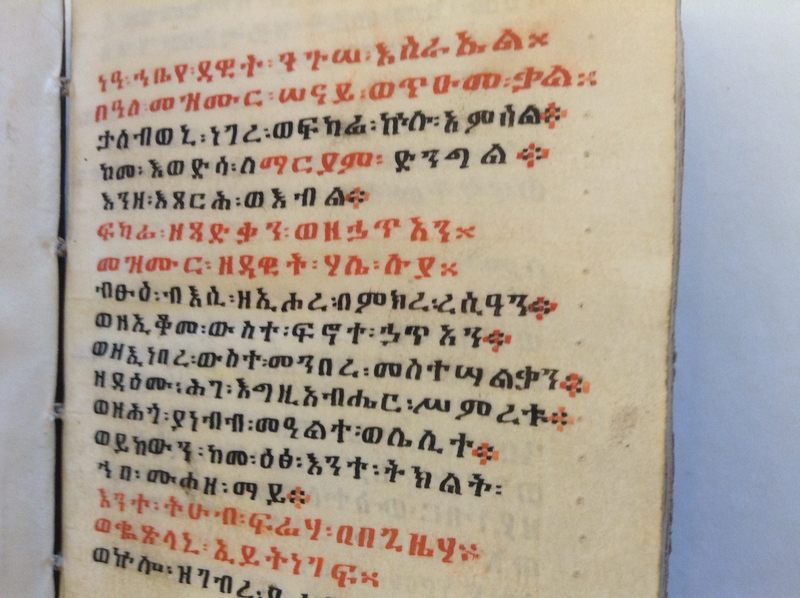 This book comes from Ethiopia and is written on gazelle skin treated to produce vellum. Note the pin prick marks on the right hand side which indicate the line markings. 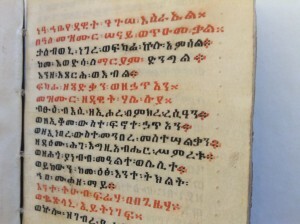 The script is the ancient language of Ge’ez, which remains now only as the language of the liturgy of a few select Ethiopian orthodoxies. The ink is a very dense black with a vibrant red contrast. The book is bound as a coptic binding which is incredibly flexible, and the cords are thought to have been made from the wild banana plant (see also the St Cuthbert’s Gospel – the oldest European bound book). 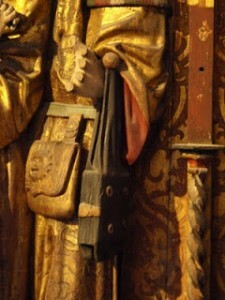 The covers are from cedar wood, and you can see that the covers, as in all coptic (and some other) bindings are drilled such that they can take the cords which are then tied off inside the back cover. 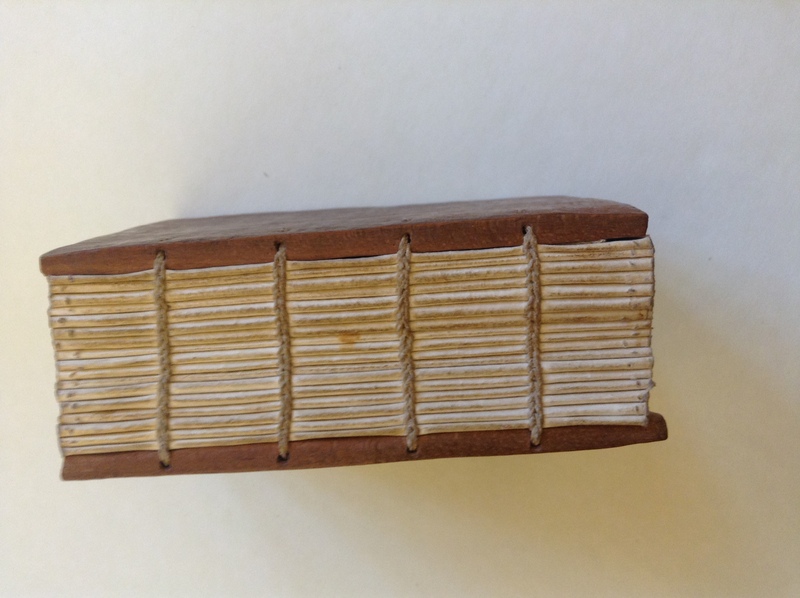 The book slips inside an animal skin ‘pocket’, which is carefully constructed from stiff vellum-like skin, perhaps a less-scraped skin from the gazelle? 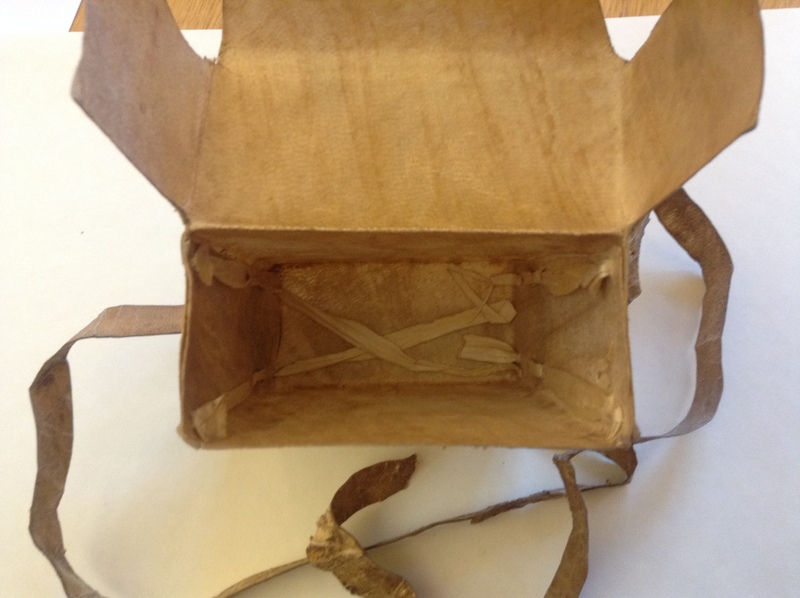 The thongs to tie the case together are also animal skin. The case was obviously made for the book because although it is not tight, it is a snug fit and ensures that the book doesn’t move around inside when being carried. 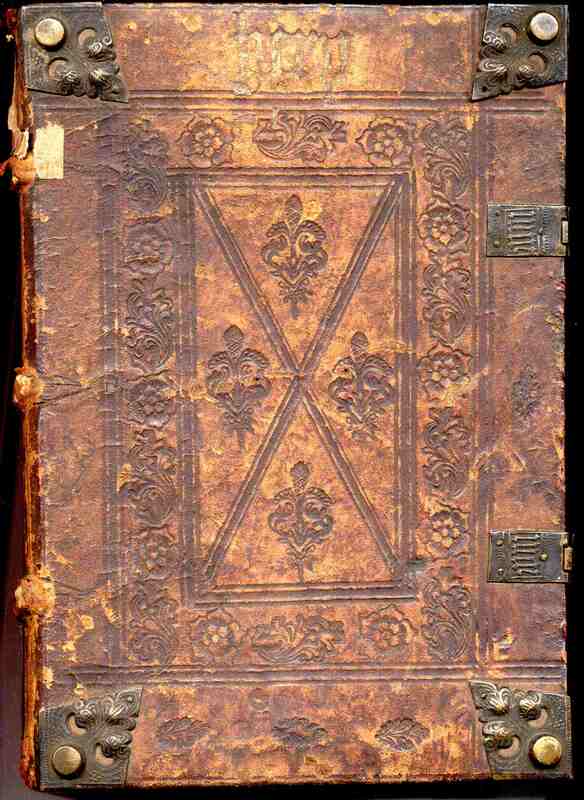 Then there is an outer slip cover which ensure that the whole of the book is protected in transit. This is made of the same type of skin. 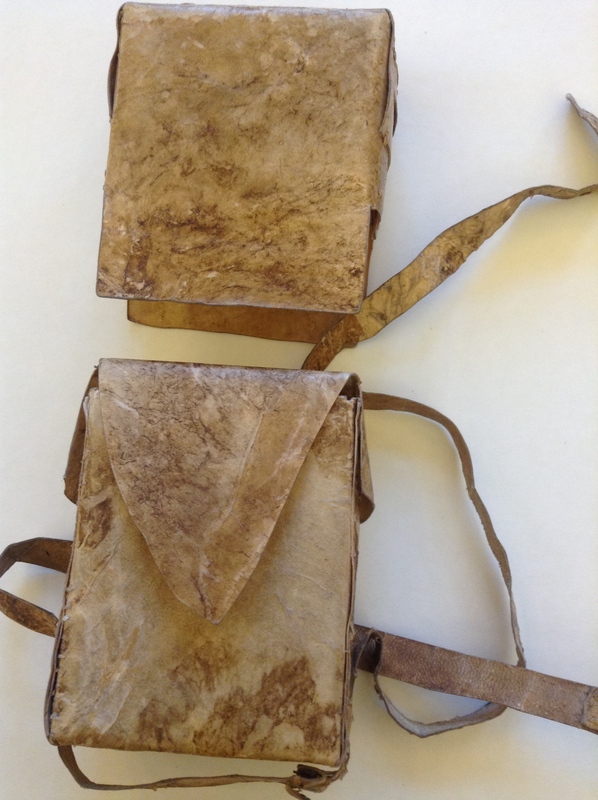 And lastly, the thongs from the pocket are laced through the top covering to ensure that the book cannot fall out, These thongs, then, can be tied on to a belt for easy carrying. 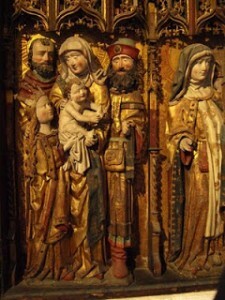 In all the case measures 130 by 110 mm (5 by 4 inches). 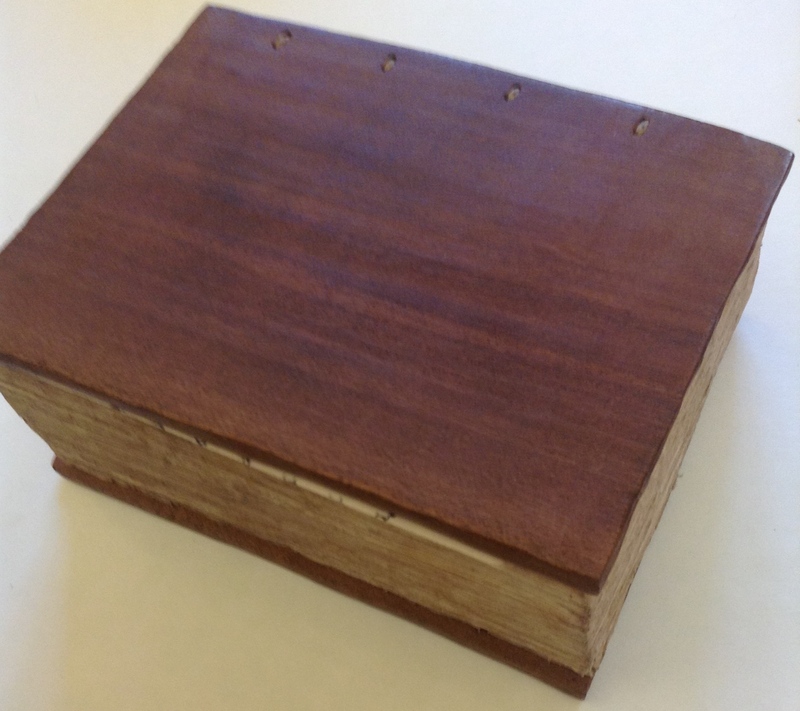 This is a book which really can be carried, especially with its handy case – so much better than a Kindle! 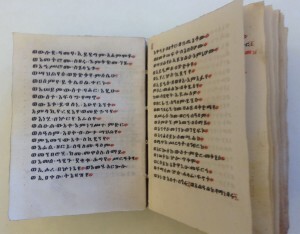 This entry was posted in Blog, Manuscripts and tagged book binding, books, Codex Amiatinus, Ethiopia, Ge'ez, girdle books, manuscript, St Cuthbert's Gospel on 18 February 2014 by Patricia.